The ultimate mobile banking app to keep your business moving. Heritage Bank Business Mobile Banking offers advancements in technology that take cash management services way beyond the basics. With the increased security of dual controls you can effectively and securely manage your business faster and easier than ever. Business Mobile Banking gives you the ability and flexibility to make decisions and approve transactions instantly from your smartphone. From a smartphone, authorized users can detect and stop fraudulent transactions before they happen. Instantly. Protects against account takeover by safeguarding the approval process for ACH, wire transfers, and account transfers. No time to visit us in person? Our app allows you to deposit checks from anywhere using your smartphone’s camera. It’s a real time-saver that keeps your money moving faster. And it’s free. The Business Mobile Banking app delivers customized push alerts so you’ll know when important transactions are ready for approval. Whether you are on the road, in the office, or at home, you can sign on and complete transactions immediately. 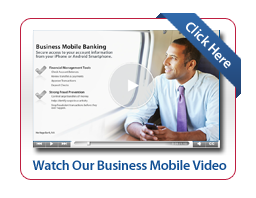 Business Mobile Banking delivers the highest level of security available. It’s the same safe authentication process you already use for Business Online Banking. Use your same password and access ID to log in. If you use tokens to log in or to authorize transactions, then you’ll use your token the same way with Business Mobile Banking. The result is multiple layers of authentication to protect your business information. No assembly required. Just download our app by searching for the Heritage Bank Business Banking app in your smartphone’s app store, or through the links on our site. Once the app is downloaded to your smartphone, you’re immediately ready to begin business banking on the go! Business Mobile Banking users must be authorized to approve transactions, make deposits and/or transfer funds. These permissions are managed using a computer to access your Business Online individual user settings.